Maria, a young, Catholic Austro-Hungarian, was born into a wealthy, aristocratic family, and lived a privileged, if isolated, childhood schooled by her mother and two governesses. Days before Christmas 1939 the young teenager was snatched from the fairy tale world she lived in by the Gestapo and thrown into a forced labor camp, Spandau Prison, in Berlin. For eight months she was beaten, starved, and worked almost beyond her endurance. Her family knew only that she had disappeared from the face of the Earth. Finally, the Nazi government notified them of her whereabouts, and they were reunited in Berlin-after her parents and grandmother had forfeited all their vast holdings to the Third Reich. Thanks to her mother’s schooling, Maria spoke five languages fluently and was assigned as an interpreter/translator for the government in Berlin. Still in her mid-teens she met and soon married a young German pilot, hastened perhaps by veiled threats of “repatriation” because she and her family were not German citizens. After enduring the horrors of Allied bombings, Maria, who was then pregnant, and her mother-in-law escaped to her husband’s family farm north of Berlin, where she gave birth to her son. At war’s end as the Eastern Front collapsed, she fled west with her child trying to reach American lines, only to be captured by the Russians in the little town of Eldena on the Elde River. 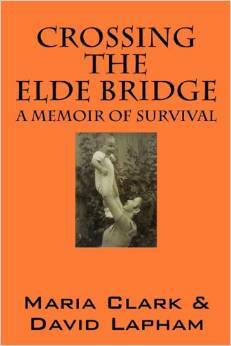 Raped, brutally beaten, and threatened with death, she finally escaped across the Elde Bridge with the help of an American soldier. When the Americans departed, she once more fled and wandered as a refugee across post-war Germany, starving, poorly clothed, and seldom able to find shelter for herself and her child. After enduring a bitter cold winter on the moors of northern Germany, she finally returned to the family farm, where conditions were bleak. Still, she was with family. But she had no idea of the fate of her husband, her parents, or her grandmother, so she decided to leave her son on the farm and go to Berlin to find a job and perhaps the rest of her family. Because of her language skills she quickly found employment with the Allies but was forced by circumstances to work with the Russians, whom by now she abhorred. Soon she was being stalked by a Russian officer who wanted to marry her. At the same time through Red Cross contacts, she learned of her father’s whereabouts and was reunited with him. Shortly thereafter, she found her mother and grandmother and was able to get them all settled in a small town in Bavaria. In the meantime her situation in Berlin became untenable, and she left in the middle of the night for Bavaria. Once more she found herself and her child in desperate straits. Her only chance for saving her already traumatized son was to send him back to the farm. But months later she was informed that both her husband and her son were dead. Maria managed to get on with her life. She was a survivor. But she carried in her heart the heavy burden of her losses-until 1991, two years after the Berlin Wall came down. Then a miracle happened. She received a call one day from a German-speaking male. He was searching for his mother. Her son was alive! After a joyous and tear-filled reunion and many visits back and forth, she returned to Eldena with her son who walked her across the Elde Bridge to dispel the ghosts of fifty years. This is an account of the heroism and fortitude of one young woman who lived through the indescribable atrocities of the most savage war in history. It is a gut-wrenching, bittersweet story of survival.